Synopsis: New York City DJ/songwriter Jack Morell (Steve Guttenberg) needs just one big break to get his music heard and land a record deal. But with the help of his retired supermodel roommate (Valerie Perrine) and an uptight tax attorney (Olympic champion Bruce Jenner), they bring together six singing macho men from the Greenwich Village scene for an outrageously 80s adventure of fun, fantasy and disco fever. Welcome to the not quite straight story of the creation of the Village People in their one and only musical extravaganza. This is Can’t Stop The Music! Welcome to the not quite straight story of the creation of the Village People in their one and only movie musical extravaganza. This is Can’t Stop The Music! Reviled by critics but beloved by fans, Can’t Stop The Music is still a jaw-dropping experience for everyone. 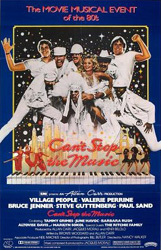 Steve Guttenberg, Valerie Perrine, Bruce Jenner and the Village People star in this notorious camp classic produced by Allan Carr (Grease) that features unforgettable dialog, unimaginable performances, unbelievable production numbers of hits like Y.M.C.A. and so much more!